We got to see Inside Out, and everyone liked it but I think I did most of all. It has Pixar's usual mix of compelling characters, vivid imagery, clever dialogue and truly amusing moments, along with life lessons—and one of them really hit home. Without giving too much away, the movie is about the emotions that rule you: Joy, Fear, Anger, Disgust and Sadness. An 11-year-old named Riley has to contend with them all when her family relocates to San Francisco from Minneapolis, Minnesota after her dad gets a new job. 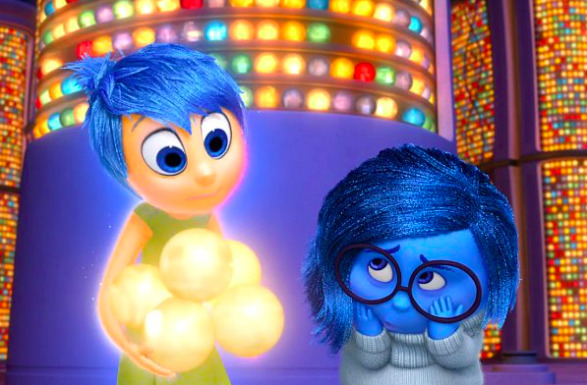 One of the film's messages: Joy and Sadness can co-exist. It got me thinking about my journey with Max. I mean, yeah, the joy and sadness an 11-year-old experiences are wholly different than the kind the parent of a child with special needs grapples with, but like Riley I had to learn to co-exist with Sadness. After Max was born there was mostly despair, which was even more upsetting. The birth of your first child is supposed to be one of the highlights of your life, only something unimaginable happened to Max and we didn't know what his future held. I'm usually a pretty upbeat person, and for the first time in my existence I struggled to lift myself up. I actually wasn't sure I'd ever be happy again, which sounds horrible to say but that's how down I was. I had to work at tapping into the joy. Taking lots of photos of Max helped; there it was, his undeniable cuteness in color. I'd take long walks around the neighborhood to clear my mind (and get an endorphin rush). I saw a shrink to help get the grief out. Going on occasional getaways was perk-inducing, too. Dave and I have always loved to travel, and a long weekend in the Massachusetts Berkshires at a friend's home when Max was seven months old was just what we needed to escape—and get some perspective—on the realities at home. The sadness diluted with time. As Max developed and so did I, I got stronger. I learned to deal with the pangs of heartbreak that cropped up, and still do. I realized that my anguish about what happened to Max and his resulting challenges had nothing to do with my faith in him, my hope for him or my love of him. Max brings me so much joy. Those moments of sadness about his past heighten my awareness of his present. Because he is an awesome kid, and he is mine. I want to see Inside Out. My transformation from follower to leader as well as from girl to woman leads to epic highs, perilous lows, and one unpredictable (bad unpredictable as in: might derail at any second and good unpredictable as in: more airtime) emotional roller coaster. Inside Out is clever, cute, and relatable from what I saw in the trailer. It really is all that, I think you'd like it a lot, Anna. I saw it. I cried, especially at the part when Riley said she felt like she needed to be happy all the time. That resonated with me because my parents always say it's great how I'm doing well. I wish I could get where you are with all that! Sadness is winning in my mind so far. Anon, is your child very young? It really does get better. I promise. 15 months. Thank you. Here's hoping! This is a perfect description of how it is to live with chronic pain. It can be quite depressing and just plain awful but you have to find the good things, the caring friends, the loving parents, and just the fun things in life. Thank you so much. Super-parent, I'm not—just a mom trying to do her best! I lost my 17 yr old son on 03-11-16. Last night 4 of his friends surprised us with a visit. In this moment....i was so happy to see them but I my body ached in sadness as my baby didn't come in with them. Joy and Sadness intertwined.